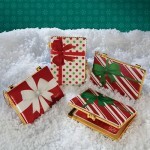 Keep your Christmas ornaments safe and sound all year ‘round with these best selling ornament storage containers. 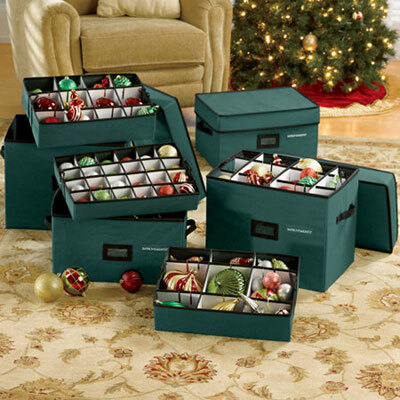 Featuring three trays of reinforced compartments that help keep your favorite Christmas ornaments safe and organized, these ornament storage boxes are a must have for your growing Christmas decoration collection. Available in two styles to accommodate various shapes and sizes of ornaments, you can even order extra dividers to customize your storage container to meet your unique needs. These storage boxes are equipped with sturdy handles to make transporting them simpler, and the trays of 24 compartments can even be removed to make decorating easier. Each wipe-clean container is made from high quality woven polyester on the exterior and polypropylene on the interior for years and years of use. The convenient identification label helps keep your ornaments in order, and each box folds flat for easy storage when not in use. Not just for ornaments, these ornament storage boxes are an excellent solution for craft items, small projects, collectibles, toys and more as well!